Calls-To-Action, 2 Minute Approval Tips, Going Behind the Scenes and More! 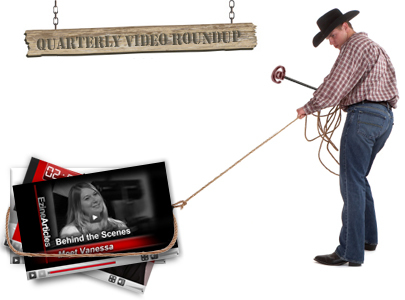 Our video studio has been busy in the last quarter producing an assortment of videos to help you, our Expert Authors, get the most out of your article writing and marketing efforts. Match Author Names – The “2 Minute Approval Tips” video series is designed to help you get your articles approved on the first submission. This first episode is a reminder to check that the person credited for an article in the Resource Box matches the byline of the article. Limit Your Links – This 2 Minute Tip focuses on the links that you put in your article. Discover how many links you can use in your articles and where to place them so you can achieve quick and painless article approvals. Deliver On The Article Title – This 2 Minute Tip focuses on the promise that your article title makes. A good article title will surely attract readers, but you must make sure that the content within your article delivers on the promise of your article title. Limit Cited Material – Your articles should contain your expertise, insights, and experiences. However, sometimes you may need to add a little further information by referencing other publications. Watch this video to discover how to avoid article rejection for cited sources. Properly Format Your Articles – Properly formatting your articles is important because it allows readers to enjoy them easier. They don’t have to struggle to try and decode what they’re reading. Manage Resource Box Length – The Resource Box is arguably one of the most valuable sections of your entire article. As an article writer, you should consider the body of your article as a give to the reader and you can take the Resource Box as an opportunity to ask people to visit your site. Monitor Keyword Repetition – Our seventh 2 Minute Tip is focused on using keywords in your articles. Keywords and Keyphrases help search engines find your article, but using too many keywords will decrease the likeliness of your article getting published on EzineArticles.com. Repurpose Content Correctly – Our eighth 2 Minute Tip focuses on how to properly reuse old blog posts and email newsletters so you can continue to grow your business. Meet Vanessa – She’s a Senior Member of the EzineArticles Member Support Team. In this video, Vanessa shares an insider look into her daily life, what she likes about working for EzineArticles and provides a few tips for successful article writing and marketing. Meet Chad – He’s a web developer at EzineArticles.com. In this video Chad shares an insider look into his daily life, what he likes about working for EzineArticles and provides a few tips for successful article writing and marketing. Original Content – We’ve all received email spam written by a machine. It’s easy to spot because it’s often 100% grammatically correct English, yet the content itself is confusing, convoluted or just plain meaningless. In essence, it’s well-structured gibberish. In the 3rd episode of our “Article Content vs. Real Life” video series, we move some of that software-derived content into the real world. Create a Writing Ritual – In our final installment of this series, Gary reaches out for assistance so he can show authors the benefits of having a writing ritual. Upload Your Expert Author Photo – An Expert Author Photo is more than just a pretty picture. It’s the first step in building your brand, credibility and that ever important relationship with your clients. 7 Tips to Avoid Misperception in Articles – Despite your best intentions, what your reader is gleaning from your article is often much different than the reality of what you meant for them to perceive. Watch this video to discover how to avoid misperceptions in your article. Article Ideas Are Everywhere: Pass it On! – Need a topic for your next quality original article? Surrounding yourself with your niche for inspiration is a great way to generate new article ideas. 6 Tips to Create the Perfect Call-to-Action – Having an effective “Call-to-Action” can be the difference between minor success and tremendous success. When crafting your call-to-action always keep these six tips in mind. You can also view all of our videos on our YouTube Channel, Yahoo! Video Profile, Metacafe Channel and our Facebook Fan Page on the “Video” tab. Be sure to regularly check back on the Blog, where we announce each new video release. Sign up to get email alerts of new blog posts, and you’ll never miss a new video announcement. Got a suggestion for a video you’d like to see? We’d love to hear it. Post it in the comments section below.